I have a love/hate relationship with socks; as an edema sufferer it’s important to keep my feet warm or I can’t walk, but if I wear something tight and rubbing there I can’t walk. So when I started knitting I slowly worked my way towards making my own socks. After many attempts, it simply hasn’t happened yet but one crocheted pair have emerged. As soon as I made those and started actually using them on a regular basis, I realised that while they were lovely and boosted my abilities they were still only about 40% suitable for me. I needed something with no shaped heel to accommodate different levels of swelling, worked with the ribbing method I’ve shown previously so I don’t have all those ridges rubbing my feet, and crocheted because that’s most natural to me. So I googled, and began the first of what will hopefully be a variety of tube socks, which I’ll link into this post as and when. 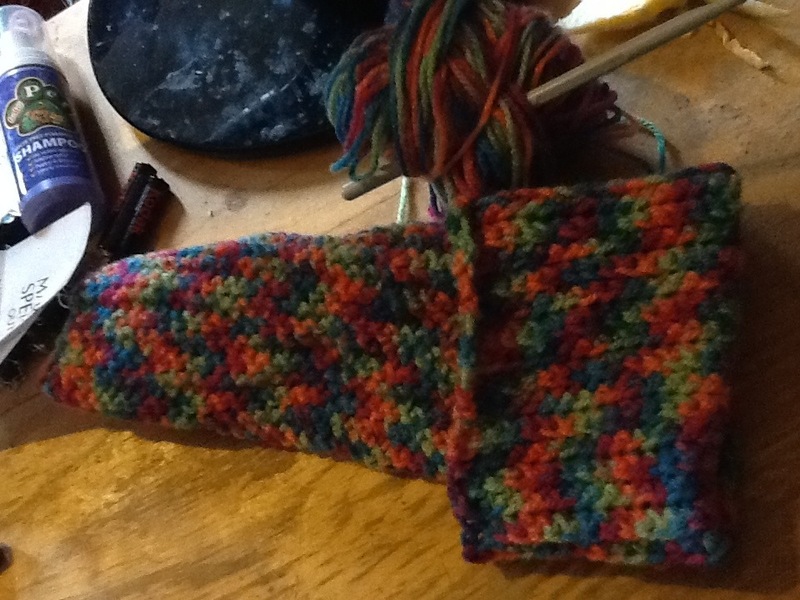 These socks are worked in straight rows of double crochet (US single) following the rib pattern outlined in a previous post, then turned wrong side out and slip stitched or sewn closed along the long side and bottom. Shown in sizes small (medium, large) around the calf. Chain 58, double crochet in second chain from hook, and in all to end of row. Working in pattern, chain 1, double crochet to end of row until you have 26 (30, 32) rows. See above for how to finish. Block by putting the completed sock on like a glove and stretching it gently until it has no more give. This stops it sliding around the foot because it’s simply too wide there and tames top curl. As I was doing this, I realised what a good arm warmer it would make with both short ends left open. 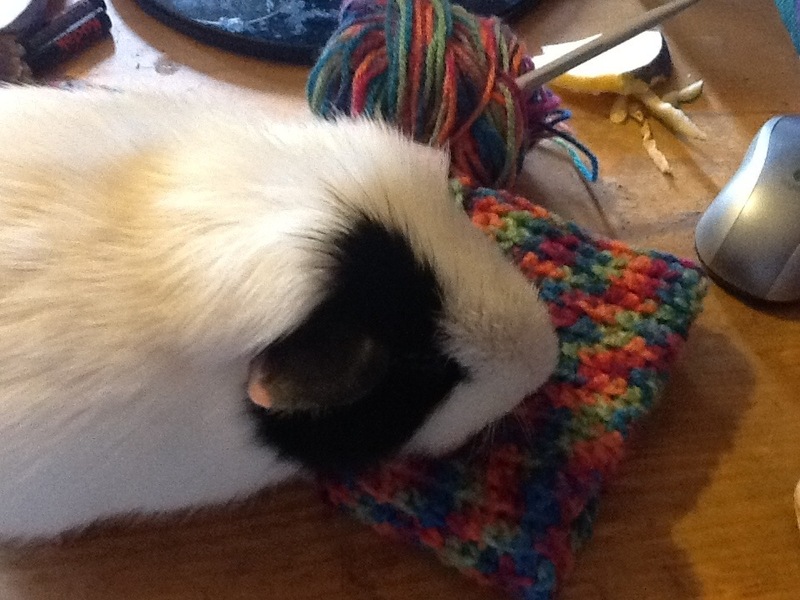 I’m not sure if Jade the guinea pig is more impressed by the sock or the carrot nearby. I’m making more of an effort to take photos of him, partly because his brother died on Wednesday and I’d always had at the back of my mind to take a photo of them on the anniversary of when I got them this year and that’s just not possible now. So I’m kinda determined to make the most of his brother, as it’s brought home that I can’t say how long I can do that. He’s climbing my arm as I type. Oh, and I found the perfect solution to second sock syndrome. Listening to CraftLit took a lot of the tedium out of it. If you’ve never listened to the show, it’s just amazing. Even when I’m not crafting, I have trouble holding a book, and the way Heather sets them up is just lovely. I’m listening to Jane Eyre as I try to work out a different version of the pattern, and the way she’s so passionate about the writing has gotten my through the painful start that I just could not endure in the written form. And that’s a great shame, cos I was really missing out.